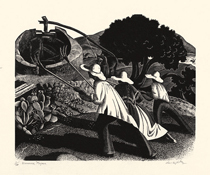 Winnowers Majorca -- 1937, Wood Engraving. Edition 200. Signed, titled and numbered 1/200 in pencil. Image size 6 1/8 x 7 5/8 inches (178 x 125 mm); sheet size 7 3/8x 10 7/8 inches (246 x 167 mm). A superb, black impression, on cream wove Japan paper, with full margins (5/8 to 1 7/8 inches). The usual glue stains in the top left and right sheet corners, well away from the image, otherwise in excellent condition. Complete with the original Woodcut Society folder, including descriptive background by the artist. Printed by Torch Press, Cedar Rapids. 1939 Presentation Print, Fifteenth Publication of the Woodcut Society. 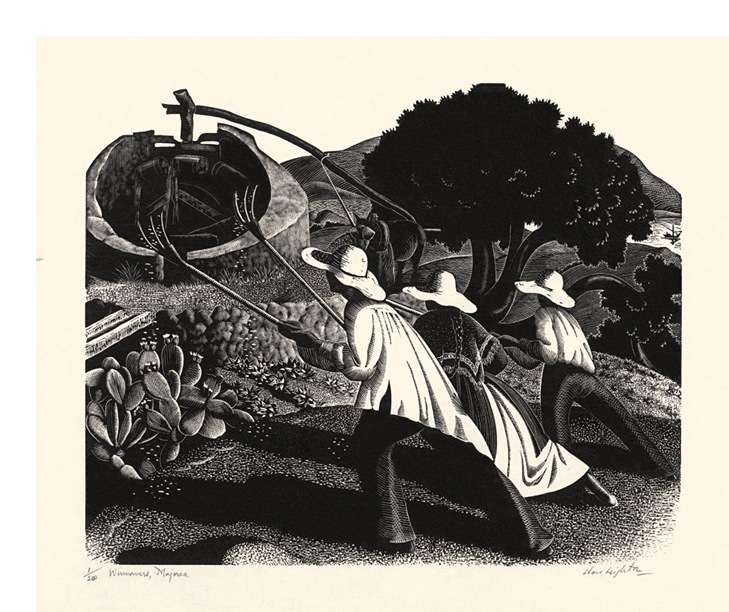 "Winnowers, Majorca, in which Spanish workers harvest beans with three-pronged forks, shows Leighton at the height of her artistry as a designer and engraver. Design, balance and rhythm combine with numerous tonal contrasts and textures, and illustrate her skill in using multiple engraving tools to render cross hatching and stippling." Collections: Auckland (New Zealand); B0ston Public Library; Library of Congress (Pennell Fund purchase); Muhlenberg College; Nelson-Atkins Museum of Art; NSW (Australia); Yale. 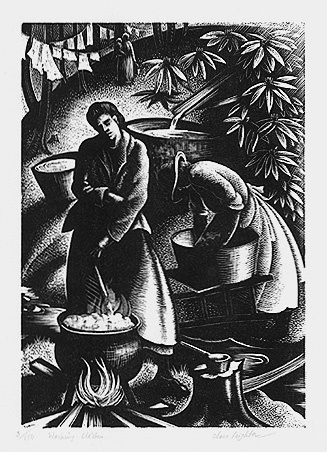 Washing Clothes -- 1951-52, Wood Engraving. Edition 150. Signed, titled and numbered 3/150 in pencil. Image size 7 x 4 15/16 inches (178 x 125 mm); sheet size 9 11/16 x 6 9/16 inches (246 x 167 mm). A fine, rich impression, on cream wove paper, with full margins (11/16 to 1 5/8 inches), in excellent condition. Created for The Frank C. Brown Collection of North Carolina Folklore, 1952.